Among Alsace white wines, Riesling seems to get the lion’s share of attention from the press and the public. That’s understandable: there are many great ones. But if any grape variety deserves to be Alsace’s poster child, in my opinion it should be Pinot gris, for its uniqueness, its intensity, and its outstanding quality. Nowhere but Alsace does the grey Pinot give wines of such power and grace and, at the same time, such extraordinary versatility with food. 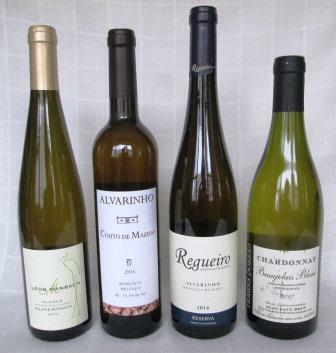 Alsace vineyards do very well with several varieties that elsewhere get only secondary interest from growers and consumers – Pinot blanc, Pinot gris, Gewürztraminer to name a few. 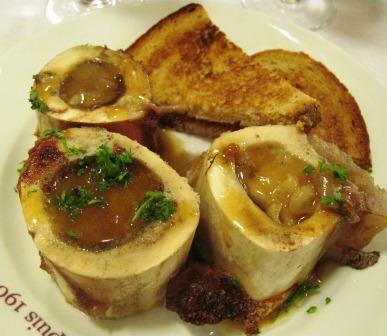 All, in Alsace, yield wines of greater interest and surprising adaptability with food of all sorts. My usual go-to wine with Indian dishes, for instance, is Gewürztraminer, whose combination of dryness and spicy fruit answers well to the intricate spicings of Indian cooking. So, when Diane decided to make us an Indian dinner, I went into my stash looking for a Gewürz – and came up empty-handed. Necessity is the mother of invention, so I decided to try a bottle of 2011 Deiss Pinot gris. It was not as old as I really like my Pinot gris, but it’s well known by now that I’m a nut on the subject of mature wines. In any event, with Indian flavors, all the usual rules are off, so I thought I’d take a flier with that barely-seven-year-old. Well, the Pinot gris worked out beautifully, starting right with the appetizer samosas and the garlic-and-lime pickle that accompanied them, and right on through a rich goat curry, butter-smothered cabbage, mung dal, and a refreshing chilled cucumber raita (all out of Julie Sahni’s Classic Indian Cooking). The wine either tasted totally dry or suggested some fruit sweetness according to the peculiarities of each dish, but its own unusual quince-and-mango fruitiness meshed very well with them all – and its typically Alsace firm structure meant that it never became flabby or in any way negligible. It was never just a liquid but became itself an important component of the flavor symphony of the meal. Deiss is a prestigious family firm, headquartered in Bergheim, which is as close as you can get to dead center of the Alsace wine zone. Deiss biodynamically farms 26 hectares of vines, spread over several villages and including at least three Grand Cru sites. This Pinot gris is one of Deiss’s basic and least expensive bottlings, so its very high quality should tell you what you need to know about the family’s more rarified selections. Mention Alsace to a wine aficionado, and 9 times out of 10 the next word that pops out is Riesling. There’s nothing wrong with that: Alsace makes some of the best Rieslings in the world. What is wrong is if the conversation stops there, because Alsace also produces a perhaps even more distinctive wine from another grape variety, a variety that elsewhere produces largely simpler, everyday-enjoyable wines. 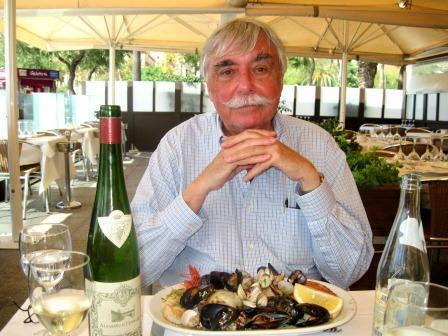 There’s nothing wrong with that either, except that, as Alsace demonstrates, Pinot gris (yes, same grape as Pinot grigio) can be stunning – rich, complex, fully dry and at the same time luscious – a very different creature from the vast majority of its incarnations in other parts of the world. Because of the physical limitations forced on me by my recent hip replacement and its subsequent complications, I haven’t been able to get out and around to taste all the newly released wines that normally I write about at this time of year, the heart of the New York wine season. Confined to home, I’ve been drinking a lot of simple, pleasant wines – or, more honestly, drinking a little simple wine as my digestion repairs itself from the ravages of some massive doses of antibiotics. Every now and then, however, I’ve had to break out, especially when my Devoted Caregiver has provided an excellent meal that calls out to be matched with a better-than-average wine. This has meant delving ever deeper into neglected corners of my wine storage, with occasionally wonderful results. In this particular case, a delicious choucroute garnie (sauerkraut is wonderful for restoring the intestinal flora) accompanied by a superlative 2004 Pinot gris, Grand Cru Brand, from Albert Boxler, a wine so distinctive, so idiosyncratic, that I simply have no comparisons for it. Let me be upfront here. A lot of people don’t like Alsace Pinot gris. They find it too rich, too assertive, with heavy, complex fruit so lush that it still tastes sweet even when fully dry. If I were pushed, I’d say it’s the white wine equivalent of Amarone – big and full and powerful, not for every meal, but incomparable when you find its slot. I love Amarone, and I love Alsace Pinot gris, especially with about 10 years of age on it. It will take more: The variety ages very well, but for me 10 to 15 years is the real sweet spot, where in a decent vintage the wine will still show youthful freshness while it has already started fleshing out its mature flavors. Albert Boxler has been for years one of my favorite producers. This remains a small, family firm, working only about 13 hectares of vines – but what hectares! The family home and winery in Niedermorschwihr sits right at the foot of the Sommerberg, one of the finest Riesling grands crus in all of Alsace, and other vineyards lie in Brand, another excellent grand cru site. Both sites are on granite soils, which contribute to the mighty structure of the wines they produce. The proudly old-fashioned label on Boxler bottles tells you everything you need to know about fidelity to tradition in this great house. My bottle of ’04 offered all the paradoxical pleasures one hopes for in a great, complex white wine: freshness with maturity, power with finesse, austerity with lush abundance. Never mind that most people think of choucroute garnie as a simple brasserie dish: That Boxler Pinot gris made love to it, coaxing every nuance of flavor out of the meats and answering them with its own battery of flavors. 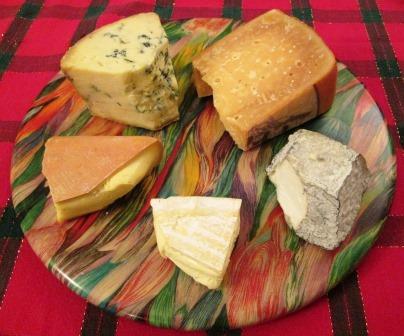 In the eloquent words of the immortal Brillat-Savarin, Yum! The other night, still under the influence of the recent holidays, I chose to accompany a simple pork loin roast with a more important wine than I would usually use for a weeknight dinner: an Albert Boxler Pinot gris, Grand Cru Brand 2004. In one sense, it was a mistake, in another, a splendid choice. The wine stole the show. 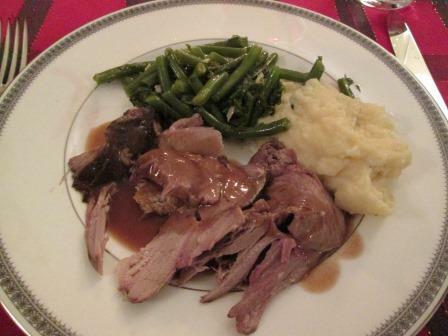 The pork roast – Berkshire pig, well-fatted and slow-cooked – was succulent and rich. The Pinot gris was more so. Already golden colored – that deep, lovely tint that most of us know from white Burgundies of great age – and so aromatic that you could be forgiven for thinking the grape a kin to Muscat, the Pinot gris was mouth-filling and intense. Slightly oily on the palate, its fruit was so forceful that my initial thought was that I was drinking a sweet wine, and it took a few seconds for my brain to register that all that fruit was fully dry – dry mango, dry peach, freshly made bread, and a congeries of smoke-and-earth flavors, all clamoring for attention. The finish went on forever. That was the (very) good news. The bad news was that that scrumptious pork really took a back seat to the wine, instead of interacting with it. A less magnificent wine would have been a better match, a lesson I will take to heart in the future. In happy dining, balance is everything. 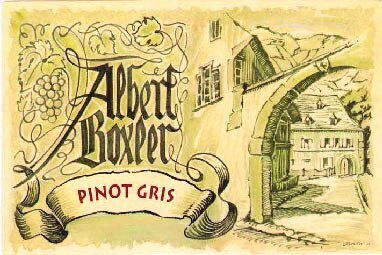 That’s not an uncommon problem with Alsace Pinot gris, which is often as forward and assertive as my bottle of Boxler was. 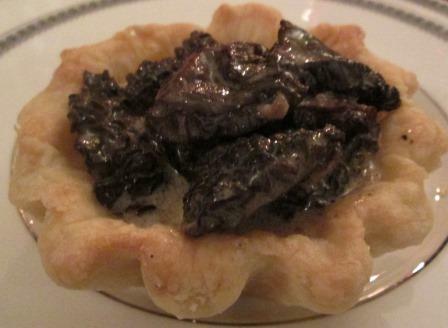 I love Pinot gris, but it can be hard to find the right dish for it. It’s a complicated grape, from almost any point of view. Palatally, it most resembles a blend of Viognier and Muscat with maybe a little Gewurztraminer thrown in. It never even remotely recalls Pinot grigio, which of course is the very same grape – or clones thereof – grown almost anywhere but Alsace. In Italy, where Pinot grigio has become ubiquitous, it is usually harvested pretty early, while the grapes still retain plenty of acidity. It is then vinified quickly at relatively low temperatures and in stainless steel to produce a wine that was once racy and brisk and refreshing and now has become (with a very few exceptions) a pleasant stand-in for water. In Alsace, the grape ripens longer on the vine, its acidity drops, and its other components flex their muscles. Vinification and skin contact are longer, and the wine that emerges is a different beast entirely – bigger, rounder, with a very distinct spicy flavor and a very forceful personality. In a world of well-mannered white wines, Alsace Pinot gris swaggers. Not a white wine for everybody or everyday, but those who like it – and I am one of those – regard properly aged Pinot gris as one of the world’s greatest white wines. 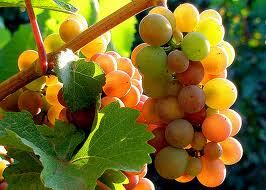 Pinot gris probably originated as a mutation of Pinot noir, as its name hints. Where and when that happened is very much a matter of conjecture, though the variety does have a verifiable history of several centuries. Pinot gris has tagged along on Pinot noir’s worldwide dispersal, but – while some good ones are grown in the US Pacific Northwest – its best production zone unquestionably remains Alsace. There, it stands as the third most popular grape (behind Riesling and Gewurztraminer) and accounts for about 15% of the vineyards under cultivation (about 6500 acres in all). So there is not a huge amount of Pinot gris in the world, and even Alsace’s production is not of uniform quality. My bottle was from an excellent small producer whose family home sits right in the middle of a Grand Cru site in the village of Turkheim: Brand, famed for Riesling even more than for Pinot gris. 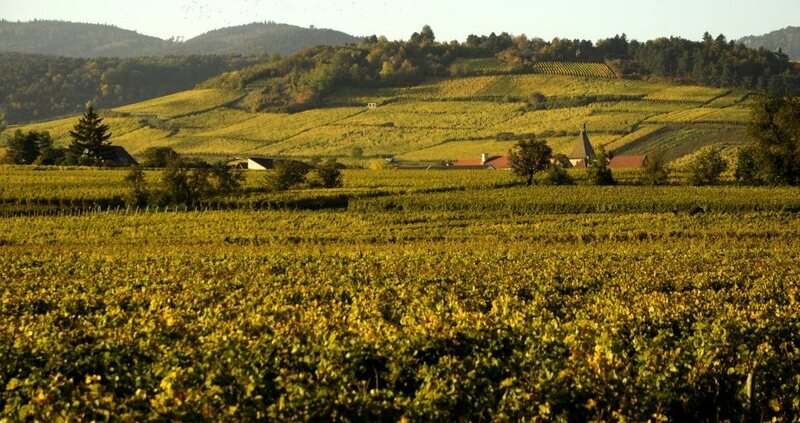 There are about 50 Grand Cru sites scattered through the 105-mile-long ribbon that is the Alsace growing zone, and they are not all equally grand. At the same time, some sites that experts consider very fine have not been designated Grand Cru, so the designation is not a foolproof sign of quality but rather a general indicator. 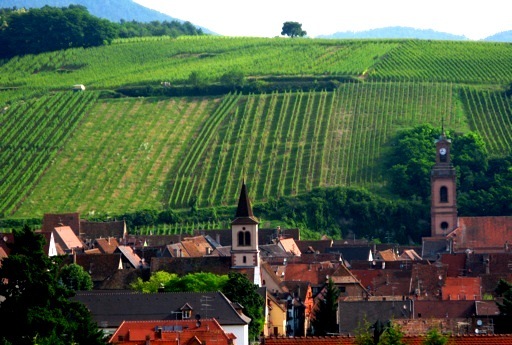 Alsace’s terroirs are extremely varied: Brand, for instance, is among a handful that have granitic soils, which makes its wines quite distinctive. Zind-Humbrecht, which is famous for the intensity of its varietal wines, also owns a portion of the Brand vineyards. Its Pinot gris is perhaps the most powerful wine of them all, and is usually priced accordingly. In addition, Alsace, like Burgundy and the Italian Piedmont, has benefitted from global warming. It has enjoyed more excellent vintages in the past 10 or so years than in the 30 preceding – so this is a good time to acquire and put away some of this intriguing variety to develop the wonderful character it is capable of. Young Pinot gris is certainly pleasurable, but I like them best between 5 and 10 years old, when they still show an intensity of fruit but add to it more complex, developed flavors. Of course, the very best vintages – my 2004 wasn’t even one of those – can go longer than that and grow yet more complex and powerful with each passing year. It was the best of trips, it was the worst of trips; it was sometimes a very good wine, it was never a bad one; it was sometimes a fine dinner, it was sometimes a disappointing one. Nobody wound up at the guillotine, though one of us – me! poor me – wound up the trip with some spectacular intestinal distress, of which you do not want the details. It’s enough to know that I have suffered for my art. Diane and I decamped from rainy, chilly New York for Barcelona and Paris at the end of September. We landed in bright sunshine and warmth and enjoyed that for our whole stay in Barcelona, before returning to rain and chill in the soi-disant City of Light. I hadn’t been in Barcelona since the Franco years. It’s a very different place now – lively, buoyant, prosperous, experiencing a strong surge of Catalan nationalism, which was reflected in sometimes unpronounceable menu entries. The Catalan language, which is widely spoken and written, is closer to Provençal than it is to Spanish, and it uses “X” – pronounced halfway between “ch” and “sh” – in unexpected places. In Barcelona, the all-but-compulsory aperitif is cava: Spanish – excuse me, Catalan – champagne-method sparkling wine. I don’t normally get very excited about cava: Too many of those I taste here are stripped down to acidity and bubbles, with the fruit and/or minerality dropped out somewhere mid-Atlantic. But we drank many cavas in Barcelona, and they were all charming – nothing outstanding, but all pleasant. Must be the effect of the local air and the local tapas, which were delightful. With them and with our dinners we also drank a lot of Priorat and Penedes wines. Again many were charming but few striking. The two best wines of our stay in Barcelona we enjoyed on two separate nights in our favorite restaurant, Casa Leopoldo. The red was the Riserva Especial of La Rioja Alta’s Viña Ardanza 2001. This was only the third bottling of this Riserva Especial (the others are 1964 and 1973), and I thought it a bargain at €34. An elegant, limpid wine of great depth and complexity, it matched equally well with two widely different first courses and then with a spicy, tomato-ey tripe dish and an unctuous pig knuckle swathed with wild mushrooms. Any wine that can do that has guts as well as complexity. We enjoyed this dinner so much we arranged to return there for our final meal in Barcelona. Elinor, head of the waitstaff, who had taken charge of us the first evening, promised us a caught-that-day John Dory – Gallo di San Pedro here. 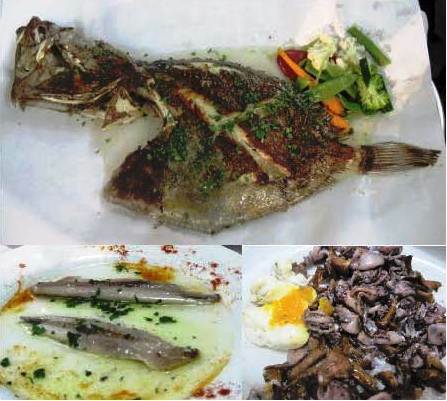 The fish was grilled magnificently and tasted fresh and rich, as were the dishes that preceded it: absolutely fresh anchovies, lightly marinated, and tiny, tiny squids sautéed with chanterelles and topped with a poached egg. 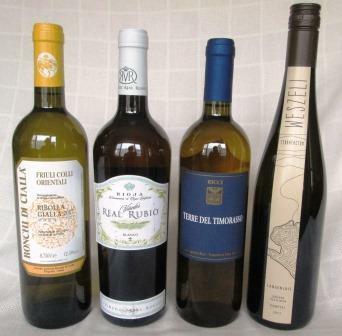 The wine that matched these very different flavors was equally rich and fresh: a big, luscious white Rueda, 2010 Belondrade y Lurton Verdejo (€44, and well worth it). A 100% Verdejo, fermented and aged on the lees in 300-liter French oak, it tasted wonderfully of fruit and mineral, with the oak showing not as a flavor but as a rounding and fattening of the lean Verdejo character. A lovely meal and a lovely wine. 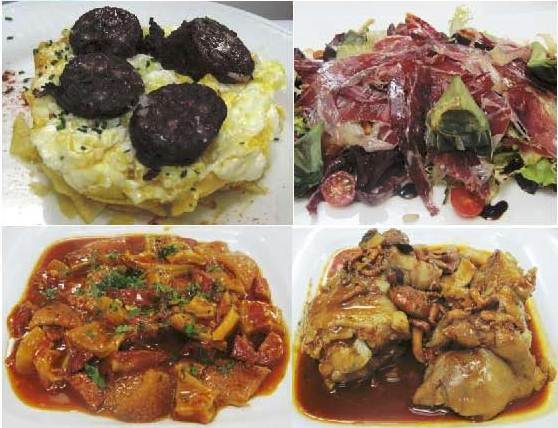 For more about what we ate in Barcelona, see this post on Diane’s blog. Paris, alas, was another story. In part it might have been the weather, but we missed the brilliance, the magic, that so many past dinners in Paris had led us to expect. 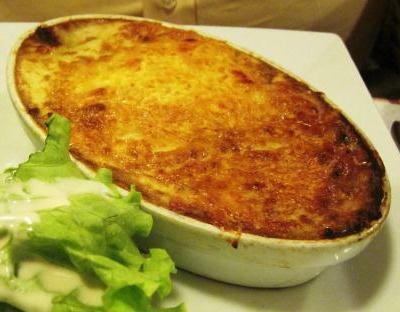 We had decided to skip the starred restaurants: What we wanted was honest brasserie cooking – but we couldn’t find it. Maybe we chose badly, maybe we were just unlucky. Some very simple things remained marvelous – sitting at a café table and gnawing a sandwich au jambon made with that amazing Parisian baguette; one lunch of roasted marrow bones followed by a small steak frites (Diane) and a shepherd’s pie (me) at Le Petit St. Benôit, accompanied by the house’s own simple Côtes de Rhône. But other places that we knew from earlier visits – Louis Vins, Vagenende – had moved more upscale and lost some of their scruffy charm (plus, in the case of Louis Vins, its wonderful list of Beaujolais crus, now replaced by a battery of middling Bordeaux). 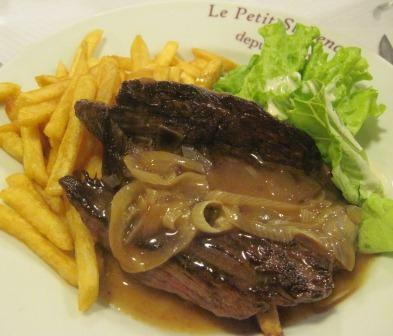 New places – for instance, Le Petit Celadon – that we tried turned out to be much more formal than we were hoping for: good food, very correctly served, but a more starched experience than we wanted. One new restaurant, in a total mix-up, turned out to be the very kind of thing we were trying to avoid, a Michelin two-star “restaurant gastronomique,” with all that that entails. And I could scarcely find any older wines. That didn’t surprise me in Barcelona – but in Paris? The best bottle of the French half of our vacation was a 1996 Zind Humbrecht Riesling Clos Windsbuhl (€134) that we drank at the afore-mentioned restaurant gastronomique: Jean Francois Piège at Thoumieux. The wine was lovely, deep and resourceful – it had to be, to match with nine largely over-the-top appetizers; a main course of Brittany blue lobster, dressed with red bell pepper puree, foie gras, and eau de coco (yes, coconut water); and a selection of five cheeses cunningly presented on tall chunks of some exotic wood – not to mention four desserts. This restaurant – the current mutation of what had been for decades a fine, family-owned brasserie – seems typical of the hot trend of restaurants in Paris and New York. The menu is essentially fixed: You get a few choices of main course, and everything else is chosen by the chef. This means that you confront a succession of elaborate small dishes which may or may not make any culinary sense. The New York Times has talked about this phenomenon recently, in its rather even-handed way. I’m not going to be even-handed: I don’t like it. I don’t want that many dishes, that many different flavors, that long at table. 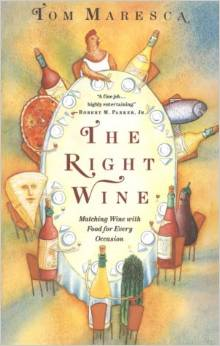 I want fewer dishes and more choices, so I can select a wine I enjoy to match with foods I want to eat. I can only hope this latest manifestation of star-chef egoism dies an early death, before, like Sydney Carton, I am driven to do a far, far better thing than I have ever done and give up going to restaurants entirely. St. Apoconarcoleptis Magna is the patron of naps, endings, the last days, and ruins, of which I am rapidly becoming one – the latter not merely a function of age and slow time but also the direct result of far too much holiday eating and drinking. Like a volunteer Strasbourg goose, I have been reporting regularly for some first-rate gavage – so here is a roundup of the best of that: my Twelve Wines of Christmas. As a preliminary, much bubbly found its way into my glass and thence into my gullet this season. 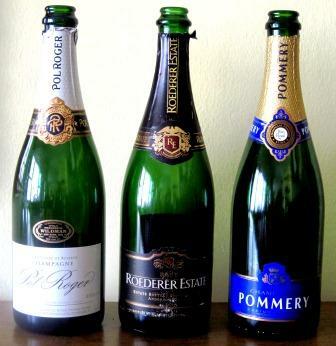 I’ve already given my account of the Wine Media Guild’s Champagne luncheon. The New York Wine Press’s fête at the Brasserie was only slightly less spectacular. 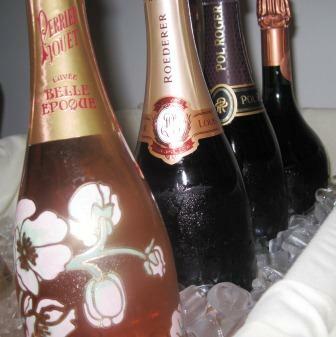 It featured rosé Champagnes – eleven of them, so they don’t count in my Christmas dozen – around a nicely balanced luncheon that concluded with a positively sinful dose of triform chocolate. Rosé is the hottest category of Champagne these days – why, no one is quite sure, though Ed McCarthy opines that rosé makes an ideal dinner Champagne, because of its slightly fuller body and slightly greater complexity. Pinot noir always seems to make a difference, and its greater presence in rosé Champagnes could be the factor behind their current popularity. All the wines tasted that day would rank as excellent on any scale, but my favorites all bunched up in the middle luncheon flight: two prestige Champagnes, 2004 Perrier-Jouet Belle Epoque (approximately $300) and 2004 Taittinger Comtes de Champagne (about $250), plus 2006 Louis Roederer, the youngest and least expensive wine of the flight ($75), and finally my favorite, 2002 Pol Roger Extra Cuvée de Reserve ($100), a great wine from a great Champagne vintage. 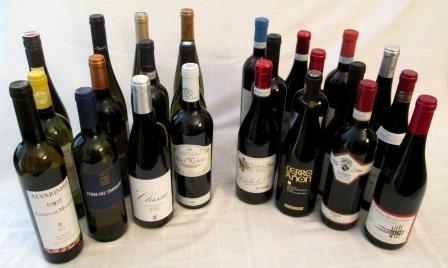 The Twelve Wines of Christmas all came from my own so-called cellar, over multiple dinners for Diane and myself and family and friends. Inevitably, these included some more bubbles: my old reliable Pol Roger NV Brut, a consistently pleasing, medium-bodied, mineral-driven Champagne, and Roederer Estate, vinified by the French Grande Marque in California’s Anderson Valley, and for my palate the best and most persuasively Champagne-tasting of California sparkling wines. Pommery Brut NV made a fine aperitif, working equally well with some duck rillettes and with Diane’s version of Torino aperitivi. For my palate, the red wines formed the pièce de résistance. Despite that piece of French, they were a varied lot: some French, many Italians, and even some Californians. The latter included my last (sob!) 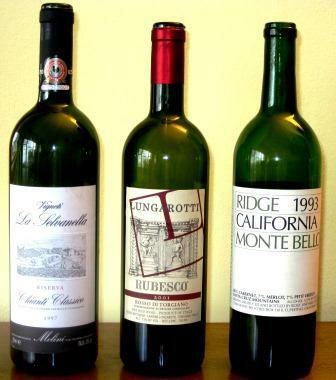 bottle of Ridge’s 1993 Montebello Cabernet Sauvignon, as lovely – and as European-styled – a wine as California produces. It gorgeously accompanied a rack of lamb and garlicky rissolé potatoes, as well as a subsequent cheese course, where it fell in love with a ripe pont l’éveque only to jilt it in favor of a creamy gorgonzola dolce. As you can see, this was a wine of many faces and facets, and I’m only sorry I don’t have any more. I said this very loudly several times, but Santa did not take the hint. Another win for St. Apoconarcoleptis. One of the most enjoyable Italian reds was an almost archetypal Chianti Classico, 1997 La Selvanella Riserva from Melini. This is a very traditionally made wine from a fine vineyard near Panzano, in the Classico zone’s prized Conca d’Oro. It also has special resonances for me, in that I participated, way back in 1998, in the process of choosing the blend for this wine. This occurred at the estate, in a session led by the very able winemaker, Nunzio Capurso, and attended by Italian and North American wine journalists. Aside from the astounding quality of each component wine that we tasted, my major memory of the session is of an idiot from Rome loudly and persistently declaiming that the wine wouldn’t be any good unless it was aged in barriques. He couldn’t have been more wrong, then or now. We enjoyed another fine wine of this type – i.e., primarily Sangiovese blended with other native grapes – Lungarotti’s 2001 Rubesco. Although from Umbria, this wine is a kissing cousin of Chianti Classico and fully matches the very best of them in suavity and depth: a lovely wine, from an equally lovely vintage. 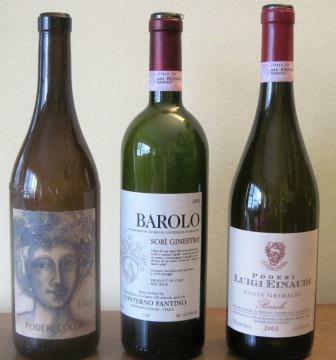 Of course I could not long stay away from the wonderful wines of the Piedmont, so I took the opportunity to test a few Barolos of the 2003 vintage, a hot, forward year that, frankly, I feared might already be over the hill – some bottles I’d tasted over the past year were. Well, in these two cases, no worries: Both Conterno-Fantino’s Barolo Sorì Ginestra and Einaudi’s Barolo Costa Grimaldi were live and, in the most complimentary sense of the word, typical. The Sorì Ginestra showed the merest trace of the vintage’s too-ripe fruit and green tannins, the Costa Grimaldi none at all – a nice tribute to careful grape selection and restraint in the cellar. Equally lovely, by the way, and much less expensive, was an in-theory lesser wine, a simple Nebbiolo, but from a fine maker in an excellent vintage. Poderi Colla’s 2006 Nebbiolo d’Alba was fully ready to drink, with excellent Nebbiolo character (black fruit, leather, tobacco, miles of depth) and no sign that it might not last another five years. All “simple” Nebbiolo should be so good. Our French selections played up very gamely as well. For me, Musigny is the red-wine sweet spot of the whole Côte d’Or. Its wines have a velvetiness and an elegance of fruit and mineral that for my palate define red Burgundy. Drouhin’s 2002 Chambolle Musigny didn’t let me down: it was a soft, luxurious wine whose flavor persisted long in the mouth. More forceful and in a leaner style – mineral to the fore, fruit after – Moillard’s 2005 Beaune Premier Cru Grèves matched quite beautifully with our Pintadeau Jean Cocteau. The wine we drank with the cheese course that evening was in a very different style, being a Bordeaux. 1989 Chateau Brane Cantenac showed the wonderful elegance of Margaux combined with the kind of structure and heft I more often associate with Pauillac: It worked beautifully with a challenging set of cheeses. Those are my top twelve, but I’ve also got a few Honorable Mentions. Amidst this red tide, we did manage to fit in a few lighter meals that leant themselves better to white wines. 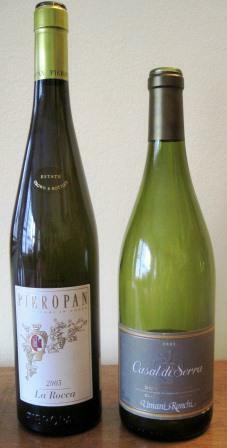 Pieropan’s 2005 Soave La Rocca shone with some shrimp. This single-vineyard wine has always been in the forefront of this too-long-abused appellation, and it remains a standard-bearer even now that the Soave Classico denomination is undergoing a tremendous resurgence. In a totally different style, but equally fine, Umani Ronchi’s 2002 Casal di Serra Verdicchio dei Castelli di Iesi Classico Superiore offered a mouthful of wine almost as big as its name. Still at nine years old showing a light touch of barriques, its biggish body and rich fruit very nicely accompanied a creamy veal and mushroom stew. Both these wines showed very dramatically, for those who may still be skeptical, that well-made Italian whites can age very well indeed. Finally, lest anyone think that my holidays were just one triumphant sip after another, honesty compels me to record my great disappointment. I had reserved a place for one potentially excellent white wine to serve alongside the oeufs en cocotte and Alsace onion tarts that were part of our Christmas dinner. I was really looking forward to Labouré-Roi’s 2003 Corton-Charlemagne Grand Cru, so you can imagine the depth of my chagrin when my only bottle turned out to be totally oxidized – just plain dead. There has been a great deal of buzz in wine circles about the problem of premature oxidation in white Burgundies. Apparently the vintages between 1996 and 2006 are involved, and the blight strikes randomly, at every quality level. Some bottles pour brown and dead, while others even from the same case remain sound. No one knows what causes it, and the producers are loath to talk about it – not only because it’s embarrassing to them, but also because (I strongly suspect) they don’t have a clue. So since St. Apoconarcoleptis Magna looks after ruins as well as endings, I’ll conclude on this note: There is nothing like white Burgundy at its best – but be warned: that bottle you’re so keenly anticipating might be pinin’ for the fjords, and might already have joined the Norwegian Blue in the choir invisible. From that comic note to a serious one: May your 2012 be happy, and both your New Year and your old wines healthy and enjoyable! This time of year activates my contrarian impulses. While everybody else is radiating good cheer, I sink into a “bah-humbug!” mood – damning Santa, snarling at children, barking at puppies, and warning my friends to stay away until mid-January. Slush, sniffles, and omnipresent retail: That’s too much of what Christmas means to me. So naturally, since almost every other wine column at this festive time of year is touting the glories of big red wines, I feel the need of a great white. It may be the shark-like echoes that appeal – but more likely it’s simply that full-bodied, complex white wines make ideal companions to turkeys, hams, big pork and veal roasts, pheasants, and guinea hens. I’ll never underestimate a big red wine – I love ‘em, and usually the more the merrier. But there’s a whole long winter before us to enjoy red wines. And summer wasn’t the time for big white wines; light and cooling was the order of the day a few months back. So this is my moment for digging into my wallet and splurging on some first-rate whites. A really fine white plays a different game than a big red. To exaggerate, it’s the difference between American football (red) and soccer (white): Both are complex, both display power and grace, but they do so in very different ways. Take, for instance, a well-known white like Chablis – not the simple AOC Chablis, but at least a premier cru from Montée de Tonnère or Les Vaillons, if not one of the grands crus. Don’t serve it with oysters for a change (though few wines marry as well with oysters in any style), but alongside a noble veal roast or a lovely, moist, sweet-fleshed fresh ham. Dishes like those will show the body and fruit and depth of Chablis, not just its refreshing minerality. This amplification effect is even more marked in the great whites from the Burgundian Côte d’Or. If you’ve fallen into the habit of drinking any old Chardonnay and have forgotten about fine white Burgundy – well, you’ve lost sight of what that grape can do. As my friend Charles likes to say, there is Chardonnay, and there is Burgundy, and never the twain shall meet (or at least they haven’t yet). I’m less impressed by the wines of Meursault than many other wine critics (that contrarian streak again), but there are many other Burgundy appellations to choose from: Monrachet and all its villages, especially Chassagne; the great Cortons; and the Drouhin monopole, Beaune Clos des Mouches, which for my palate, deserves to stand with the finest Burgundy can offer. 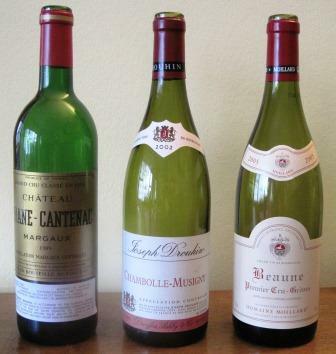 There are many excellent Burgundian négociants who are reliable sources of white Burgundies: Bouchard, Jadot, and Latour are among the best-known and most widely distributed. I happen to have a soft spot for the less-publicized house of Drouhin. For decades it has been one of our most reliable suppliers of fine Burgundies. In a highly confusing, highly competitive market, its consistently high quality has often been taken for granted, and I think the family – it is still a family-owned and family-run enterprise – doesn’t always get the credit it deserves for the altitude of its accomplishment and the moderation of its pricing. Burgundies like these offer the kinds of suave complexity that transforms a dinner into a feast – and they don’t require sophisticated cookery or complicated recipes to do their magic. Sure, Corton Charlemagne and lobster thermidor are a marriage made in heaven – but it will be just as wonderful with veal or pheasant or even a good, flavorful chicken. This kind of food/wine chemistry is not true just of Chardonnay-based wines. By and large, Americans haven’t yet caught on to the pleasures of Riesling, a grape many experts regard as at least equal, if not superior, to Chardonnay. The bracing, steel-spined Rieslings of Alsace and the more delicate, floral, dry Rieslings of Germany will do wonders for simply prepared fowl and white meats. Just make sure the bird or meat you start with is top quality, and the wine will take care of the rest. 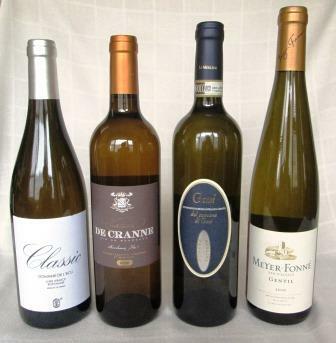 Other Alsaces: For greater spice and zest, choose Gewürztraminer or especially Pinot Gris. The latter is the body-building big brother of the adolescent-skinny Pinot Grigio and offers a taste adventure of completely different dimensions from that light-bodied, essentially cocktail wine. Hugel and Trimbach are among the most reliable and widely distributed producers. Farther off the beaten track, try the barely known white wines of the Rhone – not the simple Côtes du Rhone blancs, but those of Chateauneuf du Pape and Hermitage. They can be costly, but they are almost always worth it. Good sources for all these wines? The two I deal with most frequently are The Burgundy Wine Company and Chambers Street Wines. I’m going to give myself a holiday break so I can enjoy some of the wines I write about. My next post will appear on or about January 15, 2010. And to show that I’m not a total Grinch, here’s a seasonal serenade to enjoy. Merry Christmas and Happy New Year!